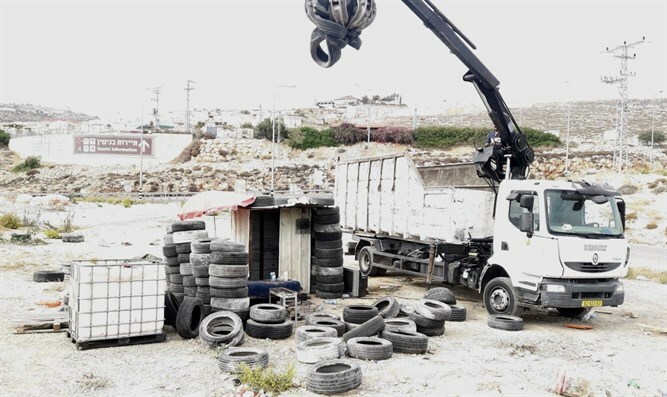 Illegal gas station, truck pouring debris by Alfei Menashe seized and evacuated in Judea and Samaria. The supervision unit of the Civil Administration carried out enforcement activities against an illegal fuel station at the entrance to the village of Ma'mash on Route 60 in Judea and Samaria. Construction on the station began about two weeks ago. The owner was issued an order and began the partial evacuation f the station. The inspection unit completed the evacuation of the entire complex without any disruptions. In addition, a truck was stopped this morning as it poured building debris and ash near a gas station in Alfei Menashe. The truck was seized by the Civil Administration's inspection unit and confiscated. Marco Ben Shabat, director of the monitoring unit, said that "the Civil Administration representatives are conducting routine patrols in order to prevent the establishment of facts on the ground, and we will continue to vigorously enforce [the law] againt illegal activities in the area."